I have had this beer many times and the experience seems to change almost from bottle to bottle. The beer pours a clear amber with ruby hues and an off white head. The nose is nice with caramel almost toasted malt aromas along with a nice floral hop aroma. Well, I can’t say that it’s bad but I’m not going or good either. It starts out with a malt sweetness up front on the tip of the tongue then a very pleasant effervescence in mid-sip. The back-end is very easy drinking. There are toasted malt flavors toward the end of the swallow. This malt flavor carries into the finish along with a dry hop bite and an almost spicy note as well. 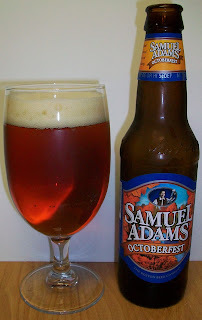 There is not much of a final aftertaste just a light hint of caramel malt and maybe some light hops as well. The hops in this beer are not bitter they are just enough for drying and leaving a light bite. As this beer warms the flavors on the back-end and finish are getting more robust, well it maybe more harsh than robust. Yeah, we are close to room temperature now and this is getting pretty bad. This year’s brew is a little better than last years but not by much. I’m giving this a C. It’s not necessarily bad but it’s not very good either. It was very drinkable even enjoyable when cold but it developed off malt flavors as it warmed. In my humble un-edgamacated opinion this is just not a well crafted Oktoberfest. Now I have to add a final commentary about this beer. This beer is fickle at best. I have had this several times this year. On one occasion I thought this was pretty good on draft. Then I had it at another location and throught it was very bad, I actually had a hard time finishing it. Now I also thought that this location needed to clean out their beer lines so that could be the reason. I have also had this beer several times in bottles. Actually I have bought 2 12 packs this year on two separate occasions. Yes, how contradictory to say a beer is fickle at best but you buy it often. I do have to admit that this beer is great for slow cooking kielbasa and sauerkraut. And that has been the main reason for the purchases. But with each 12 pack purchase I have consumed a few bottles. Again each time I have this beer it taste different. Sometimes it is very clean and refreshing with nice caramel malt flavors and a nice dry hop finish. And then there are other times that I can’t believe I’m trying this beer again. I would like to say it’s due to complexity but this is not a complex brew. I really cannot explain the changing flavors of this beer but it does appear to change substantially with each experience. These changes are not only from batch to batch but even from bottle to bottle within each batch. I appreciate the art of food/beer pairings but even that does not seem to explain this phenomenon.